Rachel is a recently divorced alcoholic, who travels to the city everyday on the train pretending to her roommate that she still has a job. Every day she passes the house she used to live in with her husband, who still lives there with his new wife and baby. A few doors down from that house she starts noticing another young couple that she comes to identify with. She makes up names and stories for them to help her feel like she really knows them. What she doesn’t know is that their lives are not nearly as perfect as she thinks they are. 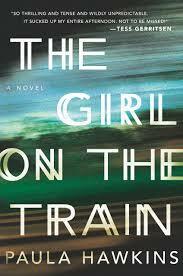 One day as the train drives by she sees something unusual that confuses her. The next day she sees on the news that the woman she has been watching everyday from the train has gone missing. Should she go to the police? Will anyone believe her with her history of erratic behavior and alcoholism? Fans of thrilling mysteries will love this title. The mystery is well crafted and keeps you in suspense for most of the book. Several important characters are discussed who all seem like they could possibly be the culprit at one time or another. The ending is exciting, thrilling, and a bit surprising. Readers looking for a psychological mystery won’t be disappointed.